This is a beautiful, wonderful film from Portugal with English subtitle. Sheep, herding, wool prep, spinning, knitting, and fascinating sound. I have two Portuguese spindles, but I’m still learning how to use this kind of spindle. The antique spindle is too fragile for spinning, so it’s a decoration only. The spindle from Saber Fazer has hand carved grooves, and feels lovely in your hand. But oh how difficult it is for me to do the right movements! My old wrist and fingers don’t want to do this. I feel so clumsy. I also need a decent distaff, so this summer I’ll go out in the woods and try to find the right little tree or big bush so I can make me one. April 23, 2016 - 2:20 pm Marilyn F.
Ah, lovely spindles. Will watch video when I have more time. Could you help preserve and maybe strengthen the antique spindle by rubbing oil into it? Old wood tends to get dry and brittle. Ah, I am curious about the shawl(?) you have your spindles lying on. Is it something you knit and spun yourself? Thanks for sharing. I don’t think I could preserve the spindle without making a thorough repair. The wood is very brittle, and the metal part will fall out. I want to keep the spindle as it is, an artefact that has been used until it’s no longer possible. That was quite the film……….poignant and informative. 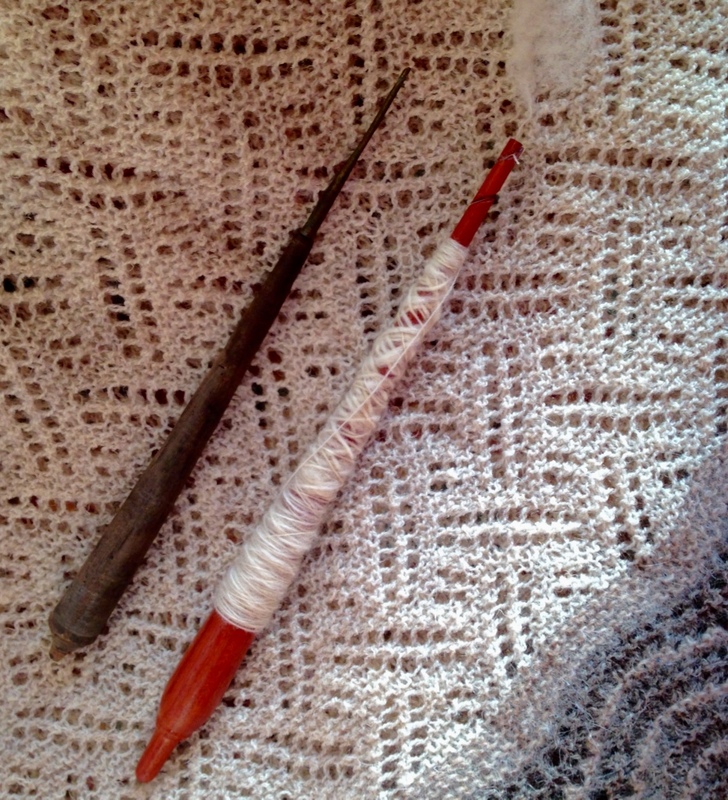 I have seen an article detailing how the Portuguese women knit. That huge trough/spring where wool was presumable rinsed was something and after seeing all the women spinning on a spindle from a distaff I was surprised to see the Great Wheels in action! Thank you for bringing this to our attention!! Thank you so much for the video link…I throughly enjoyed it!